Manually Applied Settings: On top we have any manually applied settings you may have chosen for individual Media. These take the top Priority over Default and Playlist Settings. 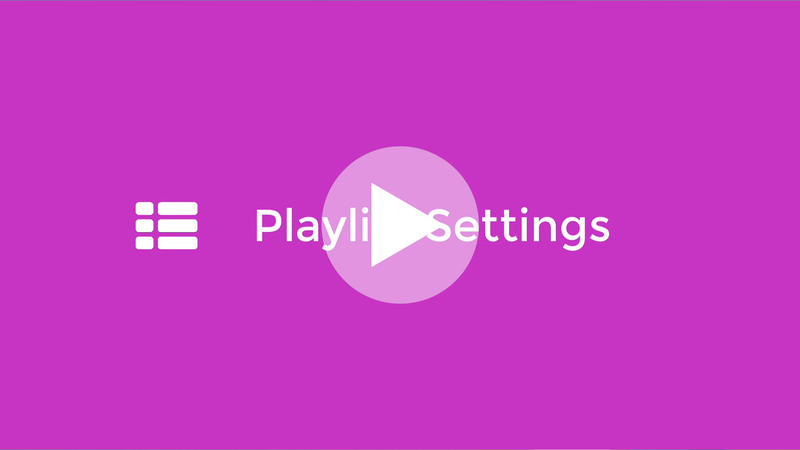 Playlist Settings: The next layer is the Playlist Settings chosen for each Playlist. These overwrite the Default Media settings for the selected Media but not the Manually applied settings. Default Settings: At the base of all settings you will find the Default Settings for each setting type which can be chosen from Settings Panel. To access the Playlist Settings Panel simply select the ▼ Playlist category in the left navigation panel. In the central management panel you will now see a list of all of your Playlists. Simply select the desired Playlist and open the Playlist Settings Panel by clicking on the General Tab below. This will expand the full view of the settings panel. If you make any changes save them by clicking on the green ✔ Save button located in the settings bar.